skip to main content ? 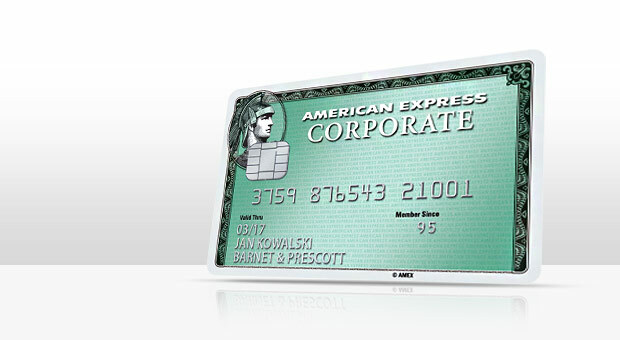 Welcome to your American Express® Corporate Card. Accepted at millions of locations worldwide, your American Express Corporate Card offers you an excellent range of benefits. American Express provides you with first-class service and support, as well as free Business Travel Insurance package, which includes Inconvenience insurance, and Medical assistance and expenses cover up to EUR 120,000. This website offers a comprehensive guide to using your American Express Corporate Card. It also provides information on Travel Insurance and the Customer Services you can expect with your Card. The Card you receive is inactive; you need to activate it first. Monday, 8 a.m. – 8 p.m.
Cardmember Framework Agreement before using your Card. Click here to review. mycardaccount and get access to your online statements. Copyright © 2014 American Express Company.